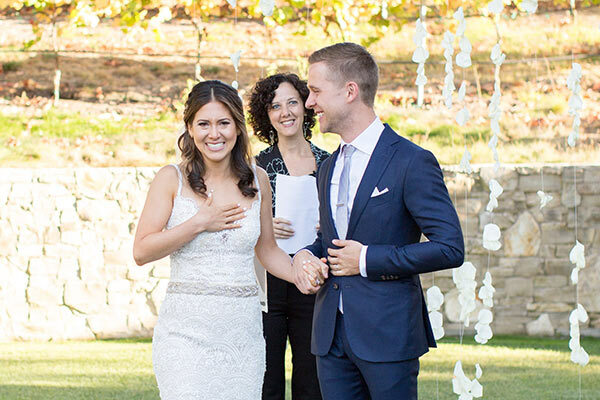 Naomi Rose, of Santa Cruz Officiant, is a gifted ceremony leader who believes that your ceremony can be one of the BEST parts of your wedding day. She aims to help you create that kind of authentic, heartfelt ceremonial experience by doing something that is too often skipped by other officiants – actually getting to know and care for her clients. With over fifteen years of training and experience crafting and facilitating profoundly personal and meaningful ceremonies for couples of all beliefs, cultures, genders, and sexual orientations Naomi is an amazing ally for any couple planning their nuptials. Naomi Rose of Santa Cruz Officiant recognizes that more and more couples identify as unaffiliated, “spiritual but not religious”, secular, agnostic, and multi-faith, and therefore don’t have an obvious mentor/elder/clergy person to go to for ceremonial leadership and spiritual direction. That’s why she is committed to taking the time to get to know couples, creating a ceremony that is elegant, inspired, well-rounded, and truly reflective of their vision, values and relationship, and ”adopting them” through the threshold of marriage. In addition to fully custom wedding ceremonies, little big weddings and elopements, and vow renewal ceremonies, Naomi creates and performs funerals, memorials and celebration of life ceremonies, baby blessings, and other ceremonies honoring the various phases of the life cycle. To learn more, head on over to Naomi’s website contact page by clicking here. Photo credit: Laura and Rachel Photographers.